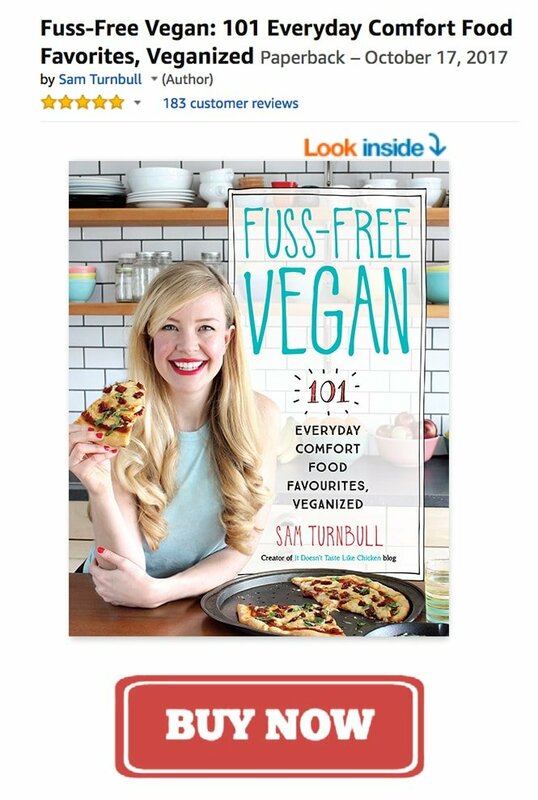 First of all, I just have to say 7 DAYS UNTIL THE PRESALE OF MY COOKBOOK!!!!!!!!!!! Whew. Ok, I can relax now. But seriously, I’m so excited. I’ve been counting down on social media, but there will be a HUGE presale announcement here on my blog including revealing the cover, name, some sneak peeks, a special surprise gift, AND you will be able to pre-order my cookbook so you will be one of the very first people to get your hands on one! Woot! Don’t miss it, it’s gonna be a party over here on this blog. 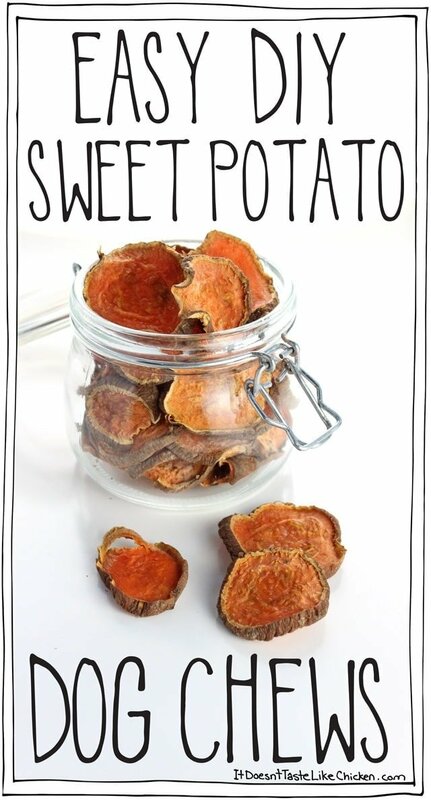 Moving on to Easy DIY Sweet Potato Dog Chews. After so many dogs (and people apparently), loved my Peanut Butter & Pumpkin Dog Treats, I thought it would be fun to make another one for the pooches. 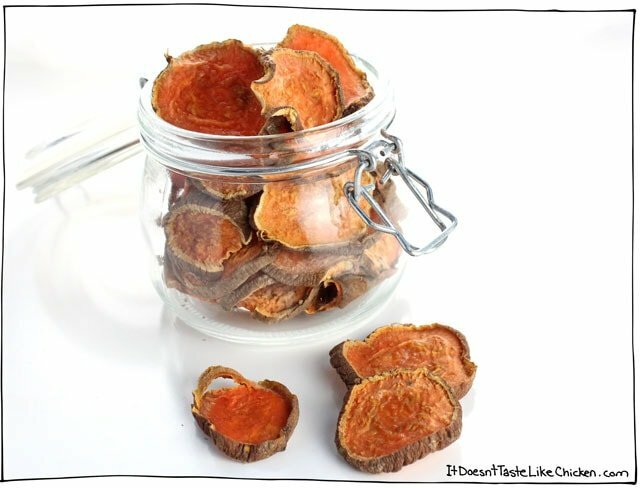 My pet store sells these sweet potato chews which Chickpea dog loves, but they are like $8 for a package, which I swear is barely 1 potato worth of slices. Seems a bit silly to me when there is only one ingredient. Yeah, she liked them all right. Really, really went nuts for them and couldn’t understand why I was teasing her with it. 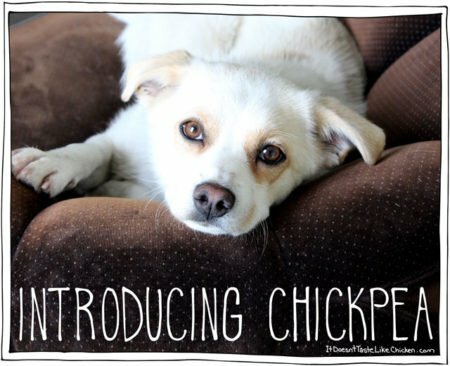 For photography Chickpea, You’re an internet famous dog, don’t you know? Of course, you could feed these treats to the humans of the household as well, I taste tested them, and dried out sweet potatoes don’t do much for me, but to each their own! 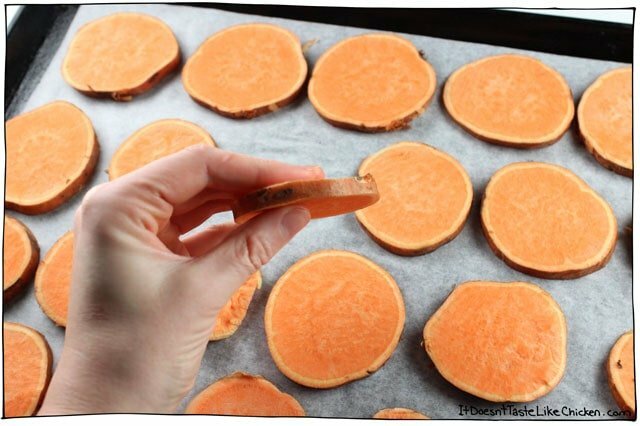 To make Easy DIY Sweet Potato Dog Chews: Take 2 sweet potatoes… Or you could do just 1, or 7, or however many you like, but I found that 1 sweet potato took up about 1 baking sheet, so I did two baking sheets worth. Slice them up. I sliced mine into coins because Chickpea is only a medium-little dog, but if you have a bigger dog you could slice them lengthwise for larger chews. You don’t want the pieces to be too thin, or they will just get crispy and not chewy, so make sure they are no thinner than 1/4 inch (see above photo for reference). I use the mandoline attachment on my food processor so it took about 7 seconds to slice the potatoes. 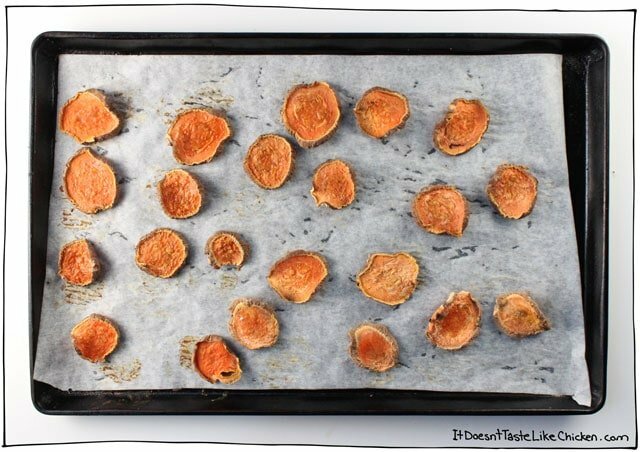 Lay them all out on parchment paper lined baking sheets in a single layer. Then just pop the little dudes in the oven for 2 1/2 to 3 hours flipping once half way through until they are shrunken, dried out, and some pieces are a bit crispy, while others are a bit chewy. Let cool, then store in an air-tight container in the fridge for up to 3 weeks. Preheat your oven to 250F (130C). Line two baking sheets with parchment paper. 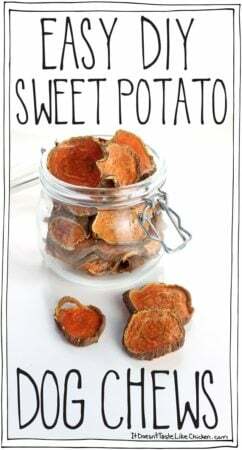 Use a knife or mandoline to cut the sweet potato into slices. I sliced mine into coins because my dog is small, but if you have a bigger dog you could slice them lengthwise for larger chews. You don’t want the pieces to be too thin, or they will just get crispy and not chewy, so make sure they are no thinner than 1/4 inch (see photos for reference). 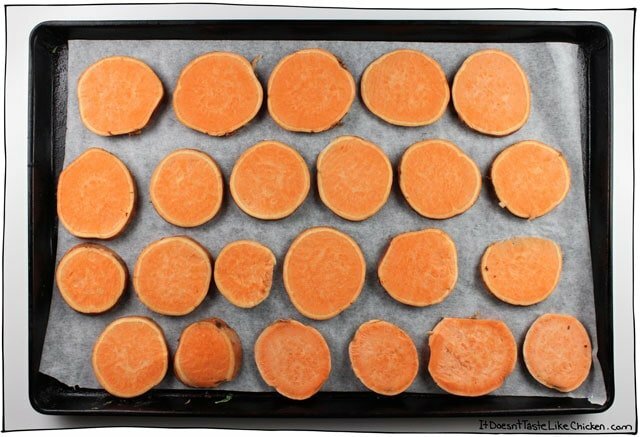 Arrange them in a single layer on the baking sheets and bake for 2 1/2 to 3 hours flipping once half way through until they are shrunken, dried out, and some pieces are a bit crispy, while others are a bit chewy. Let cool, then store in an air-tight container in the fridge for about 3 weeks. Can’t wait to try this, i’ve been buying these for over a year and have spent a small fortune. Just a quick question, you say to store them in the fridge for 3 weeks, is that just how to keep them fresh, there’s no reason we can’t feed them to the dogs the same day as baking is there? 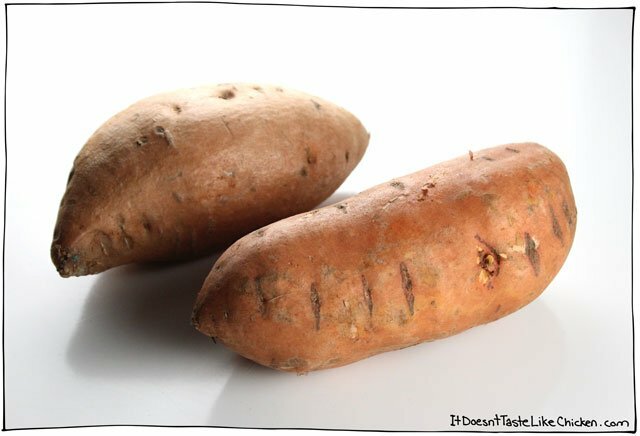 Cut them before baking, but then keep an eye on them in the oven as they will probably take less time to bake. Hope that helps! We’re in our RV for the winter and are going to make these for our 11 month old, 70# Goldendoodle, Darby. The decision we’re trying to make is whether to make them on our convection oven or in the air fryer. Aww lovely. I would recommend the convection oven. Enjoy! 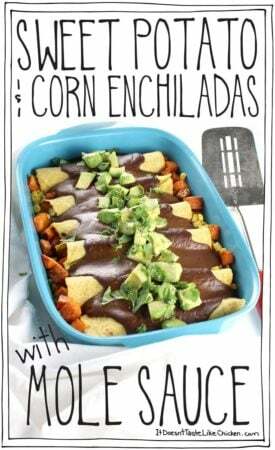 I am making these right now. I used to buy them but figured it can’t be that hard to make your own and they won’t have any preservatives in them. My dogs love these!! I made these today. I used 3 large sweet potatoes and 1 very large pan that fits the entire oven! I may have cut them a bit thin, I’m not sure, but they only needed 1 hour and 45 minutes at 250 F. Otis my dog loves them! We tried them too. The crunchy ones turn brown but taste awesome and the chewy ones are good too! Thank you for the recipe! I have so many comments! First, I have a little countertop oven, making this an awesome recipe. Secondly, since there’s controversy about skins, I roughly took some off, let some on. YOUR DOG IS SO CUTE! Mine constantly looks for treats, shop this should be perfect. If this turns out, I’m making extras to give as little Christmas gifts to friends and family. Did you bake both sheets at once, or one at a time? Any idea if adding a bit of peanut butter would work? Yep, I baked everything at once. 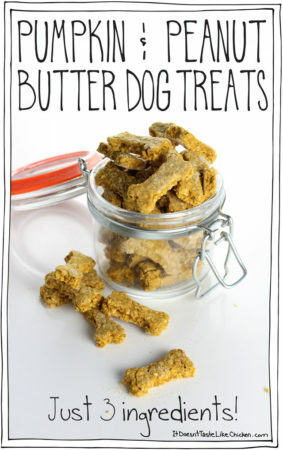 I wouldn’t recommend adding peanut butter to these but you could try my pumpkin and peanut butter dog treats. Would it be ok to use aluminum foil instead of parchment paper? Can the chews be made using a microwave oven (no aluminum foil of course). Yep that should work fine. Enjoy! Chickpea is sooo cute! Ad that’s a great name. I am preheating the oven right now to try your treats. I’ll let you know how my puppy likes them. I wanted to thank you for the good website. I noticed that the skin is on, is that good for the dog to eat? I read other websites where they say the skin is not good for the dog. I really like this treat but was concerned about the skin. Hi Roe, I’m not an expert in dog health, but according to this site the skin is good for dogs. If you prefer to remove the skin first, then you can absolutely do that. Found them! 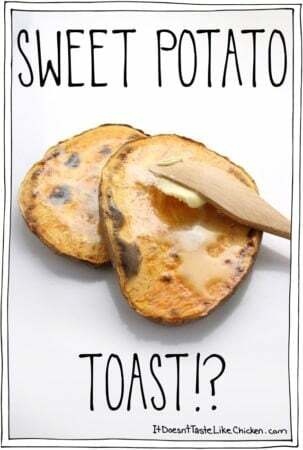 I will try the recipe this weekend. where have you been my entire life? i have been searching for a vegan, cheap and easy recipe for my poochie. this blog is exactly what ive always been looking for! so thank you! LOVE this! I used to bake Mojo cookies all the time but he would have loved these chews. I don’t know if I have enough heart left to get another dog but if I do, these will be great to make! These are a 5 star dog treat! 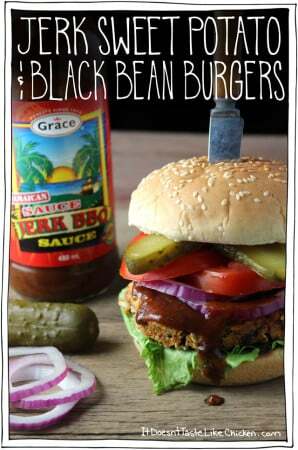 Easy peasy and delicious, my two four loggers loved them! 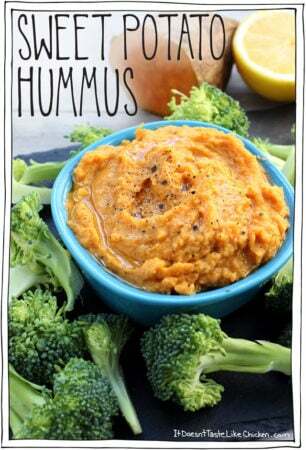 Love the shots of your Chickpea! Big hugs to both of you and CONGRATULATIONS on your new cookbook!!!!!!!!! I LOVE The pictures of her eating them – so cute! Hahaha! He will love these then. Enjoy!